While you’re in the Conch Republic, eat as the locals do. And Key West natives – known as conchs – are what they eat. Conch fritters, conch salad, and conch chowder are just a few takes on the island’s favorite mollusk, which you can find in almost any seafood restaurant. Not sure where to start? Let us be your guide. Here are the best conch dishes in Key West. If you’re sometimes squeamish about seafood, this subtle conch chowder is your best option. More akin to Manhattan style chowder than that of New England, the heavy use of pureed tomato and vegetables makes conch chowder easy to eat and light on your stomach. Stop by for a cup at Sloppy Joe’s, which serves the best conch chowder on the island. 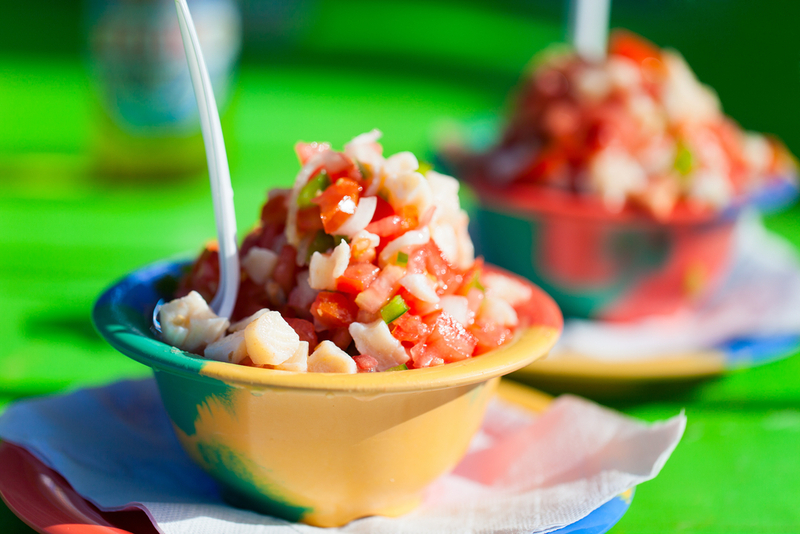 Turtle Kraals serves ceviche with only the necessary ingredients, and their conch ceviche is no exception. Try the sustainable conch ceviche, served with tender queen conch, lime, yellow tuna, bell peppers, onion and cilantro. This refreshing dish pairs perfectly with an afternoon beer. The Conch Shack has the best conch fritters on the island, so pull up a chair and enjoy an order. Fritters are served with spicy pink or Key lime dipping sauce, and guests can taste their way through a lengthy selection of lobster rolls, burgers, and other goods. This humble street vendor is open until 10pm weekdays and midnight during the weekends, so stop by for a quick snack or late night bite. Cracked conch is different from conch fritters because it’s less batter and more conch. Conch meat is pounded thin, lightly battered and then fried, making for a savory snack. Louie’s Backyard serves up excellent cracked conch, which comes with hot pepper jelly and wasabi cream. It also goes well with simple tartar sauce. Want to enjoy seafood by the water? It's always an option in Key West, with its year-round balmy weather. Check out our best rates at 24 North Hotel.